This attractive silver diamante crystal necklace set, complete with earrings. If you are going out to a party or banquet, this jewelry is the perfect accessory that will enhance your outfit. It features an amazing design and will suit any formal or casual ensemble. Material: Alloy Diamante. Occasion: Wedding, Party. Suitable for girls, perfect choice for your life, especially for party, wedding etc. 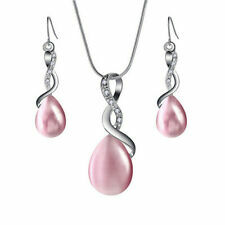 Quantity: 1set (Necklace 1 pc Earrings 1 pair). Necklace Length:40cm X 8cm/16" x 3.2" (plus X extender chain) (Approx.). Type: Luxury Silver Orb Hearts Cross Stud Earrings & Pendant Necklace Jewellery Set. Size of Pendant: 21 24 mm. Earrings size: 21 24 mm. Length of Chain: approx 500 mm. Size: necklace length is about 47cm. Color : as picture. Material: Alloy and feather pearl. Colors: Silver. Weight: 115g. B. Avoid wearing your jewellery in hot tubs and swimming pools. A: Do not clean jewellery with harsh products such as bleach or abrasives. Use Jewellery cleaner and a soft cloth to clean your gold filled jewellery. 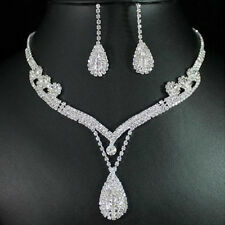 Beautifully elegant, sparkling rhinestone crystal diamante necklace & earrings set. Candy Stunning Jewellery & Bags. 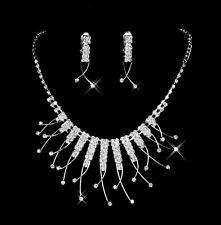 A stunning, classy jewellery set, perfect for a bride/bridesmaid or prom, evening, wedding, black tie or any special occasion. 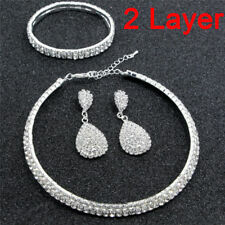 925 Sterling Silver Clear CZ Crystal Necklace and Earring Set & Velvet Pouch UK. 925 Silver Stamp of Quality. 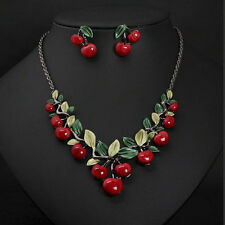 1pcs Necklace 1 Pairs Earrings. Material: Zinc Alloy ,Crystal ,AAA Rhinestone. Occasions: Wedding /Party /Prom /Anniversary. Type: Wedding Jewelry Sets. Main Color: Blue. Color : Gold Chain with Pearl. You will have an unforgettable wedding ceremony with this Bridal JEWELRY set. Dignity and elegance is the best words to describe the bridal wedding. 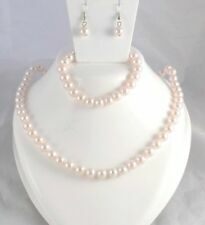 Quantity: 1 set (Necklace 1 pce Earrings 1 pair). Elegant Silver Tone Necklace & Earring Clear Diamonte / Diamante Set - NEW!